Some things are different as you travel from country to country, and destination to destination. But some things are universal. Everyone has to eat, sleep, and pee. But we do not all accomplish this in the same manner around the globe. Observing and experiencing these differences is part of the fun of travel, for me. It is a source of endless wonder and entertainment to me how there can be so many types of toilets and styles of toiletry in the world. The signage that accompanies this can also be pretty amusing. You see, in some countries (many countries, actually) you cannot flush toilet paper down the toilet. Their infrastructure is simply not sophisticated enough to handle this. I know that sounds so strange to us in the US. But it is not at all strange in other countries. 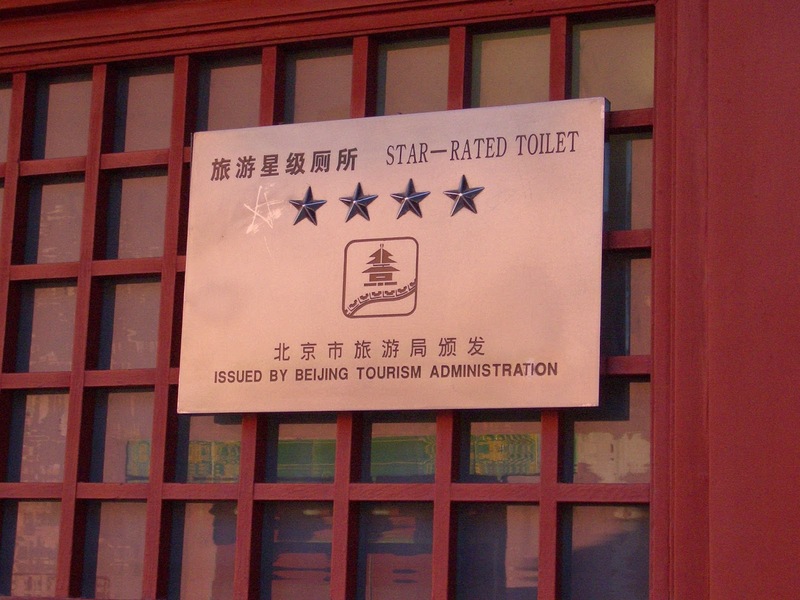 In China, for example, their bathrooms were, in many places, absolutely spotlessly clean. Shiny clean. Gleaming. 4 Stars, even. You thought I was kidding, didn't you?!? But, clean as they were, they reeked of urine (enough to make me gag), because the toilet paper is not flushed there; instead, it goes in a special little basket beside the toilet after it has fulfilled it's toilet paper destiny. And hence the bathroom smells of urine, even though it is perfectly clean. 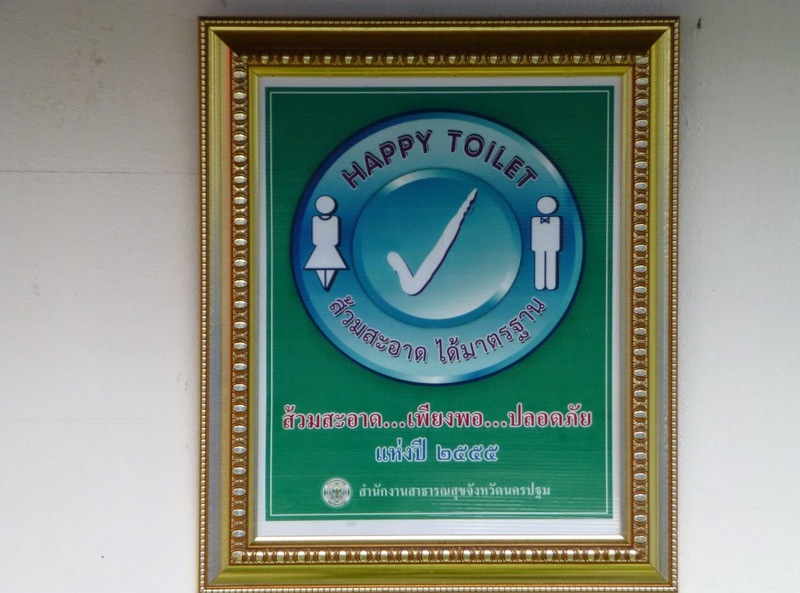 Some places in Thailand were "no flush", too. The directions at this bathroom in Spain were also pretty clear. We were visiting an 18th century castle, after all; there was no such thing as flushing it down the toilet back in the day. Ahhhh, then there's Japan, who has to post that you are supposed to flush the toilet paper, not put it in the little basket. Although I'm just judging by the pictorial essay, I don't really know what it says in Japanese. Or those other two languages. The issue of squatty-potty's comes up in this conversation, because we don't realize that, if this is all you've ever known, you might need instruction on how to use a Western toilet. Though I'm curious here about it showing up in English. 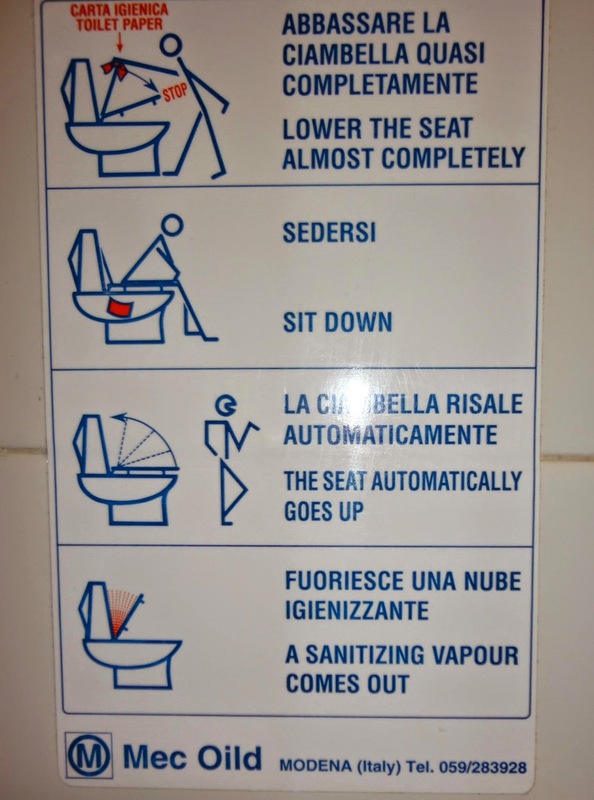 If you can read English, what are the odds that you need instructions on how to use a Western-style toilet, I wonder? Then there's this pictorial version. I think it's pretty clear even without words. In case you're not familiar, this is the famed (or infamous, depending on where you stand (pun intended)) "squatty potty". It is standard in many Asian countries. I want a lesson. A squatty-potty lesson. I've watched in disbelief as women in full-on business suits, pantyhose and high heels and all, disappear into those squatty-potty stalls and I wonder how on earth they accomplish this! I want to follow them in and get a lesson! I had a big surprise in a public park in Japan. It's cherry blossom season here, and when you hear that the Japanese flock to the parks and recreation areas, you should believe it. So they do what we would do to accommodate the extra crowds, they bring in additional porta- potties. But I was completely stunned to discover that they were squatty-potty porta-potties! One of those things I've just never thought about before. Travel really does expand your horizons. non-existent. (Evidently, staying hydrated is not a priority in these countries.) And I have found that because there is an attendant (to collect the fee), these bathrooms are usually pretty clean. 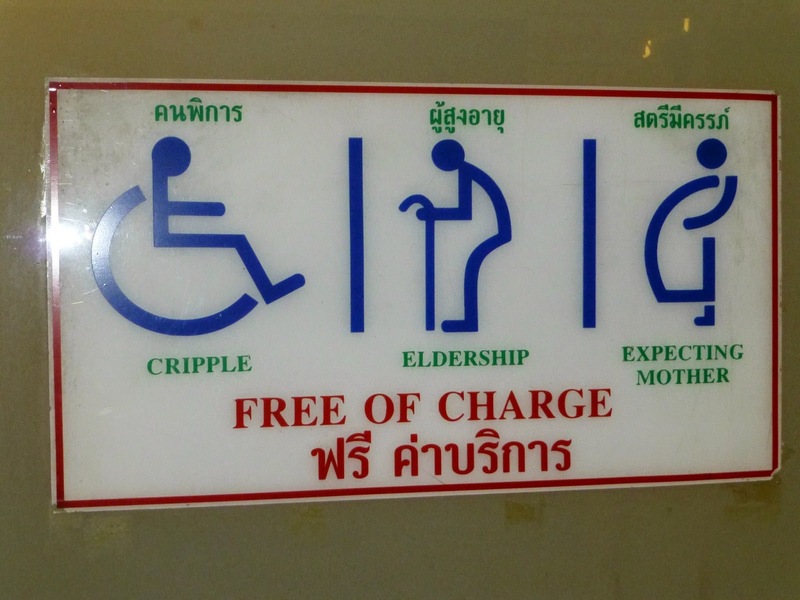 In Thailand, where respect for Elders (or Eldership) is paramount, there is evidently no fee. This was a sign posted at the Night Market in Chiang Rai. I paid, by the way. Of course in Europe bidets are big. Most of this does not bother me. It's simply a fact of life. Everybody has to eat, sleep, and pee. But the potty slippers in Japan. Well, that's one of those that I didn't want to think about too much. They issue a special pair of slippers for the toilet room in Japan. These are different than the outdoor slippers, the indoor slippers, and the "dress" slippers that you would wear with a formal kimono. They are for use in the toilet room only. This is all fine and well in my hotel room or Ryokan, but in public.....I'm wondering about folks like me, attempting to learn the squatty potty method (well, then they really aren't like me at all); using the public slippers. Hmmmm.......how clean are these public slippers likely to be??? Fortunately, I was able to avoid this encounter our entire month in Japan. Then there's the issue of what paper products are available. In China, we were warned to always carry a pack of tissues, 'cause outside of your hotel, there is never toilet paper available. Not ever. They did not ever offer us a paper napkin, either. Not ever. In Japan, however, they offer an individual hand cleansing wipe with every meal, snack, or cup of coffee. Every single time. You know the kind I'm talking about, in the little wrapper. And there is always toilet paper available (not that you are supposed to need it, because those Toto toilets will wash, blow dry, and buff your lil' hiney on low, medium, or high!). But there is never ever a paper towel offered, and even electric hand dryers were rare there. Everyone carries their own little private hand towel to use after washing their hands. There are so many instructions in Japan, it just made my head spin. Those fancy Toto toilets that wash and blow dry all the pertinent geography have a jillion buttons and options. Do this, push that, don't push that. OMG!!! Does it really have to be this complicated?!? Especially because, our first night in Tokyo, I accidentally pushed the "panic" button in our beautiful suite at the Capital Tokyu Hotel (it was big and it was red, and without glasses on it looked like the best option for "flush", and I had just traveled for umpteen hours straight, so give me a break here.) This required a phone call to the room to be sure some elderly person had not fallen and could not get up; and then required a hotel technician to come to our suite to reset it. Of course, Mr. C could not be seen as the one having made this crucial error, so he was quick to point out to the tech that it was me. I do not, to this day, blame him one little bit. Just so you know, Mr. C, I would have been just as quick to give credit where credit is due, had it been you. I did this not just once, but twice during our stay at the lovely Capital Tokyu Hotel. Yeah, I know. It's gonna' be a loooooong trip. And sometimes it's not ~~ Which one's mine?!? Which one?!? Seriously, I mean it, which one is mine?!? I just flew 14 straight hours, which one is mine?!? Sometimes it's innovative, like the "Momma & toddler" potties @ the mall ~ just plunk the kid in the toddler seat while you use the Toto.......This one also had a child-size potty seat available.....Which I thought was so smart ~ keep those Momma's shopping! It's usually for customers only (just like back home). But I don't think our signs are quite this entertaining. And sometimes it's jazzy and a bit outdated. Come on now, ya gotta' love the stick figures! Especially the third frame ~ he looks so pleased with himself! Sometimes it's just hard to figure out. Sometimes it would just be great to be a 4-year old boy. 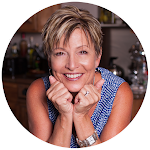 I have ultimately learned, through these travel experiences, that my need to use the bathroom is distinctly proportionate to how clean or user-friendly that particular bathroom is. It's a profound revelation, actually! And I have also learned to always always always take my camera along ~~ because you never know what you'll find! Wow! Such a fun blog and so many good travel tips! These travel treasures are just the very ones that can make an adventure so much smoother! Like why we plan our shopping day strategically with Nordstrom’s fit in there at critical times of the day! ‘Cause we love those gorgeous restrooms! So many great photos, showing us so many different rules, so many life lessons! We live in a big ole world and your blog article reminds us of such in a very fun, clever way!! I've learned to buy a 12-pack of travel tissues before each trip......they become tissues, toilet paper, face cloths, napkins, ear plugs, sunglasses cleaners ~ and if I don't use them all, they are easily left behind. My other best friend are the wet naps in little travel packs, handy for sticky snacks or messy street food. These items are indispensable on the road! 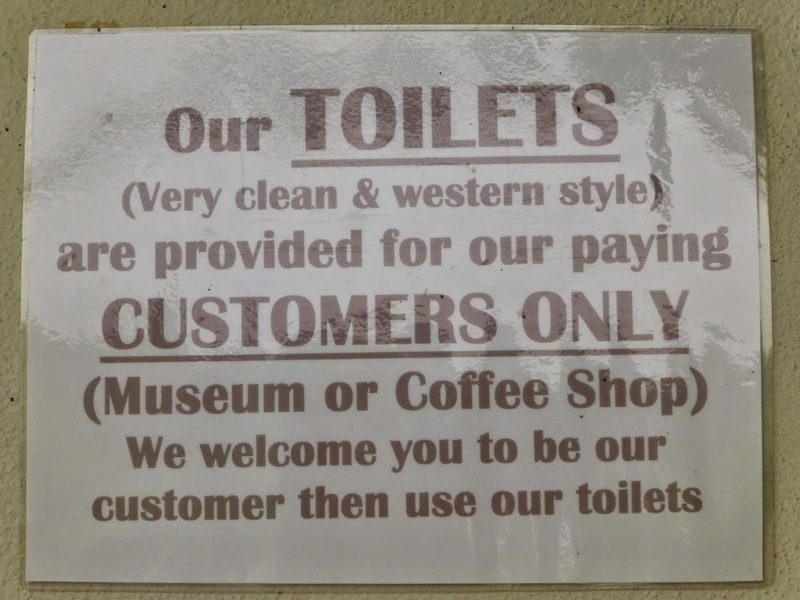 Toilets and traditions - Something every traveler faces but the comparisons you demonstrate between locales are totally amusing.